It’s a new year and since my family and I will be moving out (first home, yaaaas) at the end of the month, we’ve been doing a lot of cleaning up around our place. In the kitchen, I kid you not, we had to decide what to do about the four save the dates and three wedding invitations we still had hanging up - all weddings that have come and gone. As much as I love paper stationery and would certainly have kept them, my hubby quickly reminded me that they weren’t exactly ‘relevant’ anymore, not to mention, they were taking up loads of real estate on our refrigerator. Alas, off they went into the trash, but not without me first thinking ‘hmm, if these had found their way to my inbox, I could have kept them foreverrrr.’ 🤔🤔🤔 Greenvelope thought of this solution wayyy before anyone of us had, and they’ve been turning out tremendous virtual stationery for vows for nearly a decade. So, we had to tap their expertise to clear up some of the biggest misconceptions about online wedding invitations. They had A LOT to share, so make sure you keep reading for 5 things you didn’t know about what kind of killer ONLINE correspondence is out there RN for your wedding day. Online wedding invitations are tacky. It’s a wedding, you have to send your guests something tangible. Okay, for real, there are two myths in that statement. 1) Online wedding invitations - in their current iterations - are anything but tacky. Pretty sure I’ve spent the last hour+ looking through Greenvelope’s crazy comprehensive, exceptionally-beautiful, well-designed, and totally bespoke collection of wedding offerings. And ‘tacky’ hasn’t crossed my mind whatsoever, in fact, what I’ve seen has actually blown my mind. 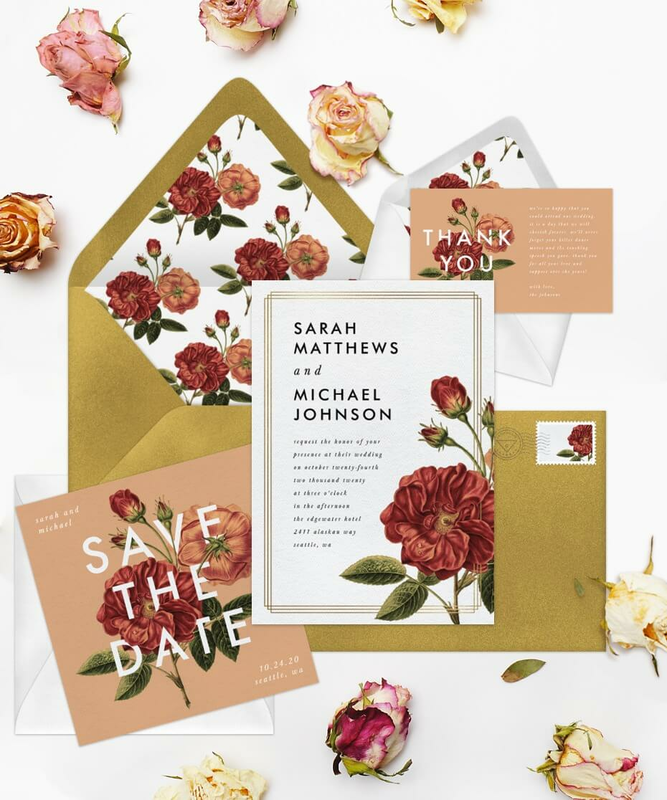 Online stationery isn’t what it used to be, and couples who are getting ready to celebrate the biggest and best day of their lives thus far can enjoy all of the gorgeous, fabulous stationery styles of traditional paper, just in an eco-friendly and effortless online service. Oh, that 2)? Yeah, I think I sufficiently squashed that misconception in my opening. Something tangible isn’t the only way to go, and you’d also be doing your guests a favor by not sending them something that they’ll be tossing out as soon as you’re jetting off to your honeymoon. Online wedding invitations are lazy. Nope! Not at all. 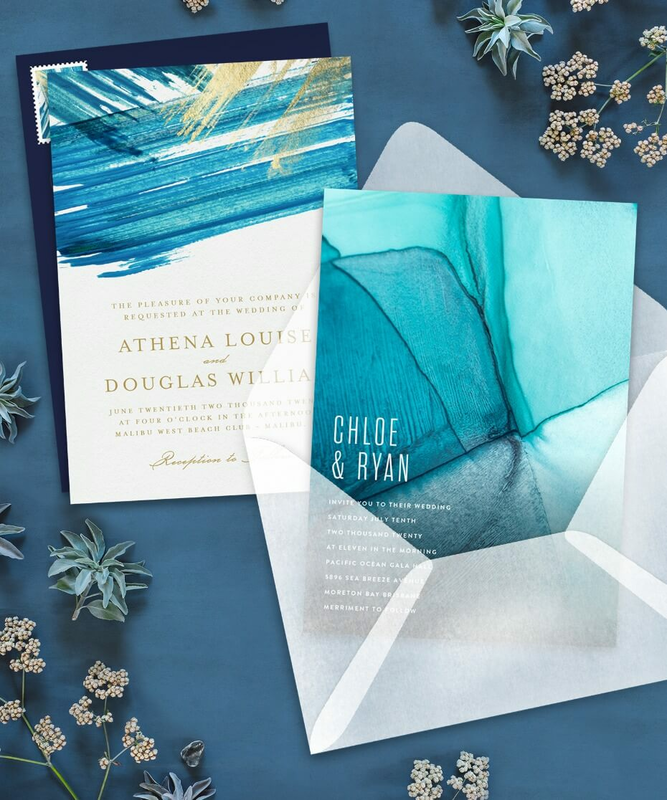 Maybe when they first were conceived, they were considerably more limited, but now, the options that couples have for their save the dates, rehearsal dinner and wedding day invites, etc. are dizzying. We’d even go as far as to say that online wedding invitations are for the most ambitious brides and grooms. Why? Well, take a look at Greenvelope’s wedding repertoire. It’s so vast and varied and best used by couples who already know what they want, know what their style is, and can visit the site, apply some filters to their search, and find the perfect design to vibe with their wedding day. Not saying that couples who get paper invitations are lazy, of course not, but there’s certainly the potential to go on autopilot when they meet with a stationer or go in-store to find their stationery. With Greenvelope, you can absolutely get help if you need it, but for the most part, you can feel empowered to choose your own adventure and find exactly what you need for your nuptials. Total lie. If anything, online invitations are even more adaptable to new trends! Whether that be new hues for 2019, like Living Coral, or harmonious color combinations+palettes like cosmetic neutrals or mixed metallics, or desired design cues like deckled edges, clean, modern layouts and typefaces, romantic hand lettering (yes, that can be done with online options just as much as traditional print designs), trends can be translated for online stationery, too! 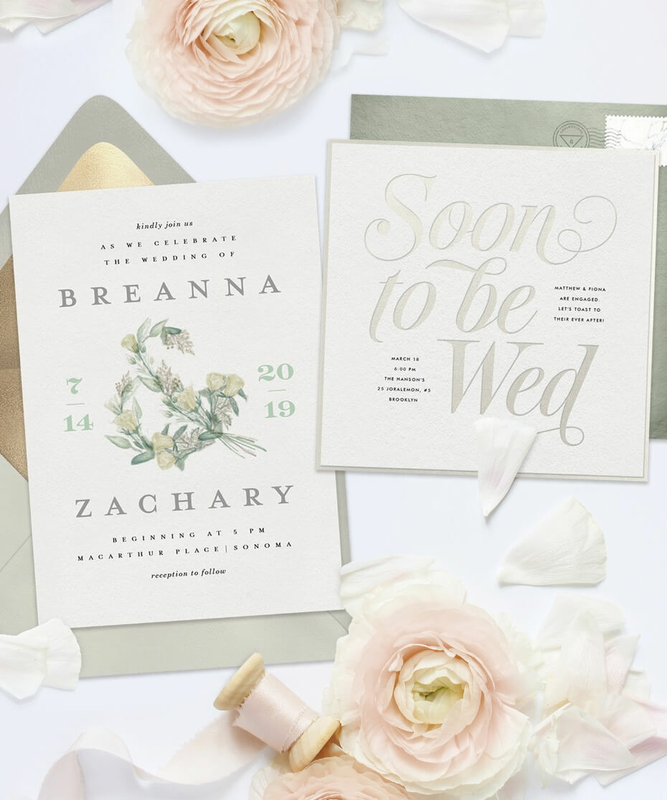 Greenvelope works with stationery designers who have already made a name for themselves with their traditional design portfolio and are interested in expanding their contemporary, trend-forward focus. Just take a peek at their impressive cache of designers and stationery tastemakers, from Colin Cowie to Niru & Baku, the people who have done pretty things with paper can do it for your paperless look, too! YES! With online invitations, you get what you and you don’t get upset. AKA. Whatever template you choose will be what you send. Not even. Remember when we said that Greenvelope offered bespoke invites for couples to peruse? We weren’t kidding! In addition to their already affordable regular pricing structure for a single-send service (i.e. one invite sent out to X amount of guests), the brand has yearly membership pricing that affords couples even more opportunities to save $$. 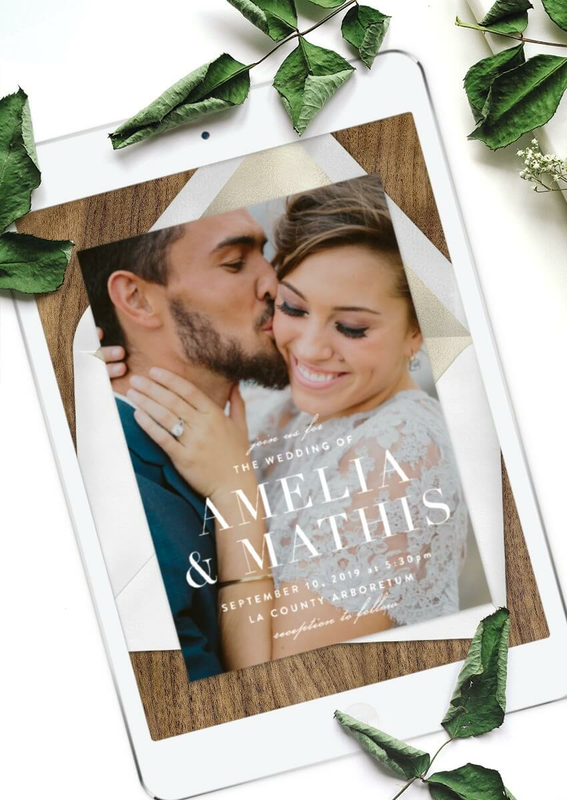 Their bronze membership includes unlimited invitations, save the dates, announcements, and cards to be sent to up to 250 people each for only $195. Unlimited invitations, people, UNLIMITED, for less than $200 (that's less than $1 per card, unheard of, really). Wow. And if you’re looking for something truly bespoke, you can even add a fully custom design service! And when we say fully custom design, that’s not an understatement. Couples can work with their designers to create an invitation or card design from scratch. All they need to do is send along a specific vision and wording and their designers will create a template that is perfectly suited for the happy occasion. The only caveat being that requests for advanced designwork or hand-done art incur additional costs. Actually, with online invites, you’re even more likely to get RSVPs from your guests - and on time at that (which is great, because who wants to have to harass their family and friends for responses when they should be trying to eliminate stress in the final days before their wedding). Greenvelope has a fool-proof messaging system that allows customers to send invites out in batches, so you can add guests to your event at any time; not only that, you can also automatically resend invites to those who haven’t even opened the card yet - can’t do that with paper invites (at the very least $5-10 per card) or nudge guests who haven’t RSVP’ed yet to get their yesses or nos over as the deadline to respond grows near. 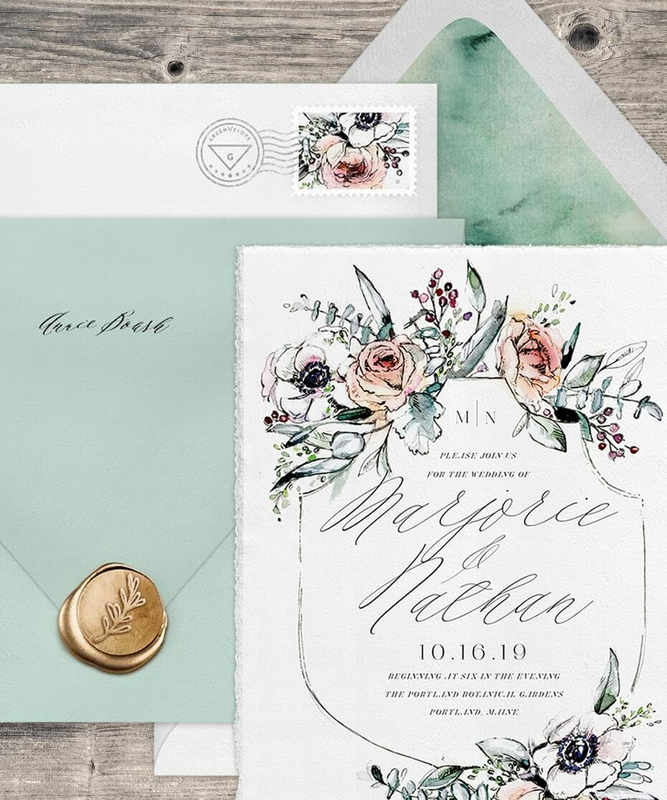 Now that we’ve dispelled any of your concerns re: online invitations, if you’re interested in giving digital a try, visit the Greenvelope website to learn more or start browsing their full collection of wedding invitations. I’ve already been scouting out designs for my son’s second birthday… And I can’t wait to send!! How’s this for an RSVP-guaranteed invite?! Follow Greenvelope on IG for even more fun designs! 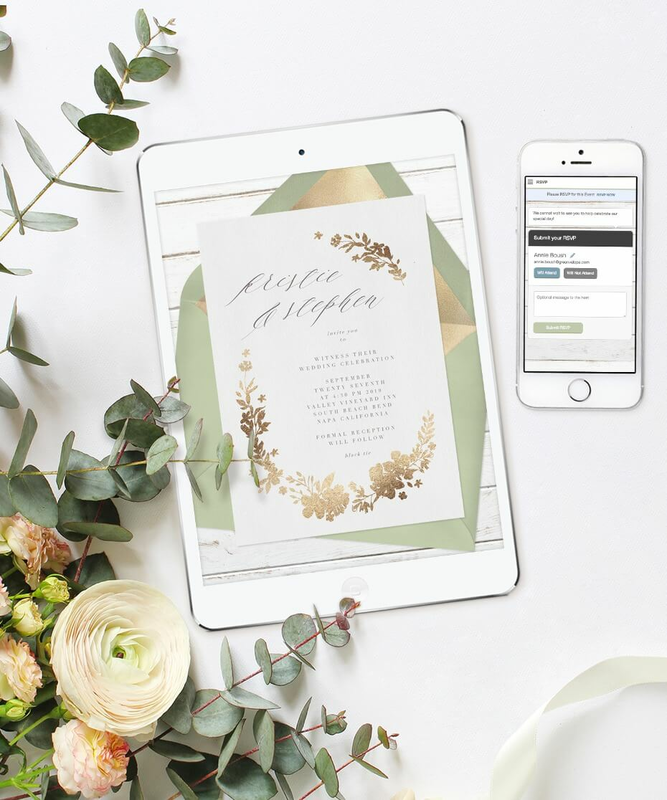 We partnered with Greenvelope to share what we think about online invites #yesyesyes. As always, thank you for supporting our sponsors!